Check out some of our features. We take website push notifications to a whole new level. Advanced Segmentation Create targeted segments based on page views, device information, geo-location, attributes or events. Scheduled Notifications Schedule your campaigns to go out immediately or send them out automatically on a specified time/date. Automated Notifications Set your campaigns to repeat daily/weekly/monthly or specify triggers to automatically send notifications out after an event is triggered. A/B Testing Split test any part of your push campaigns (title, body, icon, image) and see how they perform in comparison. 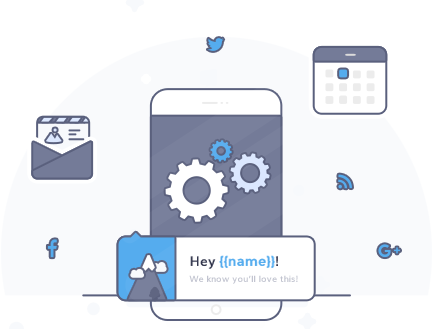 Subscriber Alias Associate a custom username or email with your subscribers and make it easier than ever to to send subsequent server side tracking or push notifications. Custom Branding All push notifications and optin prompts display your own website, no Aimtell branding is shown to your visitors. 3rd Party Integrations Connect your Facebook, Twitter, Pinterest or even Blog to automatically send notifications. Powered by Zapier. Dynamic Notifications Create custom tailored notifications based on custom user attributes. Conversion Tracking View detailed campaign reports – from sent to clicked to custom goals/conversions. Unlimited Websites Add unlimited sites per account, with the ability to jump between them in just a few clicks. Team Members Create additional team members and grant them access to any of your sites in the dashboard. 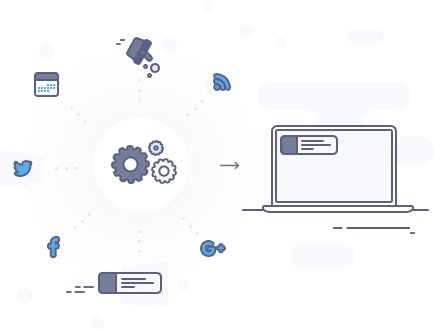 Full API Send notifications programmatically, check campaign results, add user attributes and more. Your Subscribers/Data You have 100% control and ownership of all of your subscribers and data collected. Import and export them at any time! Expiring Notifications Schedule notifications to automatically expire after hours, minutes or days. Emoji Support Full support for emojis within any push notification. Large Image Support Leverage large images to dramatically boost click throughs on push notifications. Welcome Pushes Send push notifications immediately after a visitor subscribes. Customizable Opt-in Give your audience a reason to subscribe to your notifications. Control opt-in prompts on a page-by-page basis. Timezone Delivery Boost engagement by having your notifications deliver based on the subscribers's timezone. Abandoned Funnel Schedule notifications to automatically send after a user abandons any funnel such as forms or carts. GDPR Compliant Compliant with all GDPR regulations & part of the EU-US Data Privacy Shield.